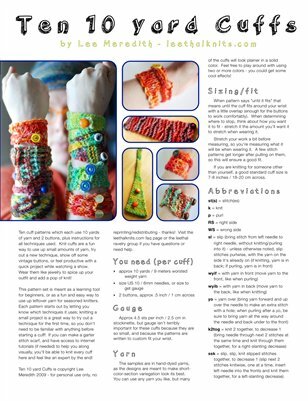 This is a knitting pattern collection for ten different wrist cuffs. Ten designs, each using 10 yards of yarn, and 2 buttons, the set is meant not just to be a fun way to use up leftover yarn scraps for any knitter, but also to be a learning tool for beginners. So there are explanations of each abbreviation, and some info about things like eyelet holes, short rows, and slip-stitches in case you’ve never done them; but it’s also great for playing around with small amounts of yarn and making fun little accessories, for knitters new and old! See the Ten 10 yard Cuffs page on leethalknits.com or on ravelry.com for photos and more details about the pattern.